A content delivery acceleration service, based on Alibaba Cloud's CDN to accelerate content delivery for hybrid sites, dynamic sites, and applications. Dynamic Route For CDN (DCDN) is a high-performance, reliable, and secure full site acceleration solution. This service aims to accelerate access to hybrid sites that use both dynamic and static resources. 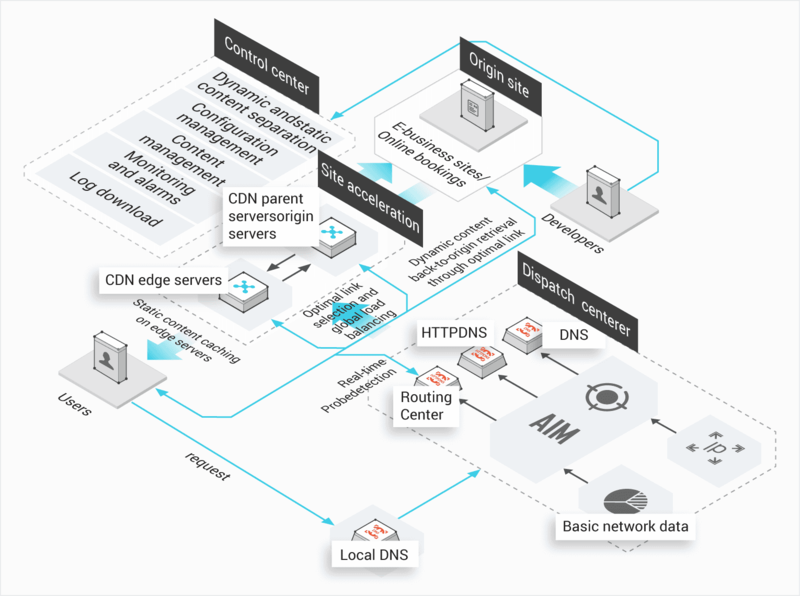 DCDN integrates multiple products and services, such as dynamic acceleration systems, smart static content caching, HTTPS, and operations security. You can use DCDN to both speed-up access and ensure the stability of your site. Easy acceleration for the entire site without the need to divide static and dynamic content. Provides more than 1,300 nodes covering six continents and redirects user requests to the nearest node for high-performance data transmission through real-time routing and stack optimization. Maximum bandwidth of 90 TB/s for content delivery with 7/24 service support to reduce costs of operations. Full encryption over HTTPS and integrates with multiple types of access controls, to guarantee secure content delivery. Full site acceleration, static and dynamic content separation, smart routing, stack optimization, data compression and merging, and error code page customization. Smart static content caching on edge servers. Hierarchical and distributed caching to reduce loading. Custom configurations for accelerating static and dynamic content. Smart static content caching on edge servers. Hierarchical and distributed caching to reduce fetching from the origin. Real-time link quality detection and origin fetching through the optimal link. Transfer layer and application layer protocol stack optimization for fast and stable data transmission. Full site load balancing with multiple fetching protocols, site monitoring, and error code page customization. Support for multiple types of origin sites, including public IP addresses, Object Storage Service (OSS), and custom domain names. Support for multiple types of websites, including public IP addresses, Object Storage Service (OSS), and custom domain names. Monitoring for promptly detecting and preventing access failures. Traffic throttling and queuing policies to guarantee the stability of services on origin sites, when the sites experience bursts in traffic. Dynamic content acceleration with session persistence and re-connection on failover, to ensure high-performance origin fetching and information synchronization. Response page customization for error codes such as 403, 404, 503, and 504. Includes anti-leeching, tampering prevention, and access control. Includes referer and IP address whitelists, and blacklists to prevent leeches. Includes URL encryption and authentication. Includes HTTP DNS hijacking prevention, HTTPS encryption and authentication, and URL encryption and authentication. Includes IP address blacklists, region blacklists, and user agent (UA) blacklists. Supports certificate-based authentication on clients, free certificates, SSL optimization such as HTTP/2 and SNI, and acceleration schemas without private keys. Full link transmission over HTTP/2. Supports header compression, request priority setting, link multiplexing, and server pushes. Access optimization, without restrictions to IP bindings. Session resumption to reduce the SSL and TLS session negotiation time. Force HTTPS in web browsers to enhance access security. Redirection of HTTP requests to an HTTPS origin site or redirection of HTTPS requests to an HTTP origin site. Certificates provided by the clients are used in mutual authentication to authenticate the server. Supports free DV and SSL certificates from Symantec, which is a leading SSL and TLS certificate provider. Domain name configuration, billing management, and resource monitoring in the console are used to implement flexible management and control. Monitoring and displaying of the network traffic trends on dashboards. Simple configuration of domain name-based origin sites, static and dynamic content acceleration rules, and access control. Uses URL refresh to ensure access to the latest content, and the content push function to cache the content updates on nodes to prevent a burst of origin fetch traffic. User access log downloading to help website data analysis. Simple modification of billing methods and purchasing of data transfer plans. Product presentation, online payment, and sales promotion. E-business customers use hybrid sites with rich content. These sites provide services such as user registration, logon, product search, product preview, and online payment. Therefore, the performance of these sites has become an essential metric to evaluate the user experience. Content loading acceleration for cross-ISP and multi-client access to origin sites. Intelligent dispatching network for seamlessly resolving stability issues. Multiple origin fetch policies, which support origin fetch queuing to offload the traffic on origin sites. Rich site content with frequent and dynamic updates. Home pages that are used to access forums, interactive live streams, and news all require fast responses. Interactions on these pages also impose high demands on the access speed and effect the stability of the website. Any burst traffic may cause website congestion. Domain name-based real-time full data monitoring and service-based intelligent dispatching. Traffic throttling and queuing policies for hotspot protection in the event of burst traffic.